At last, an Oscar-winning film that’s truly remarkable. Lazlo Nemes’ Son of Saul is a frenetic, frenzied, bleak masterpiece. October 1944, Auschwitz-Birkenau. Saul Ausländer (Röhrig) is a Hungarian member of the Sonderkommando, the group of Jewish prisoners isolated from the camp and forced to assist the Nazis in the gas chambers, crematoriums and death pits. It’s slavery with no hope of a future: Saul and his fellow inmates know that the Nazis routinely eliminate the Sonderkommando. While working in one of the crematoriums, Saul discovers the corpse of a boy he takes for his son. As the Sonderkommando plans a rebellion, Saul decides to save the child’s body, find a rabbi to recite the mourner’s Kaddish and offer the boy a proper burial. 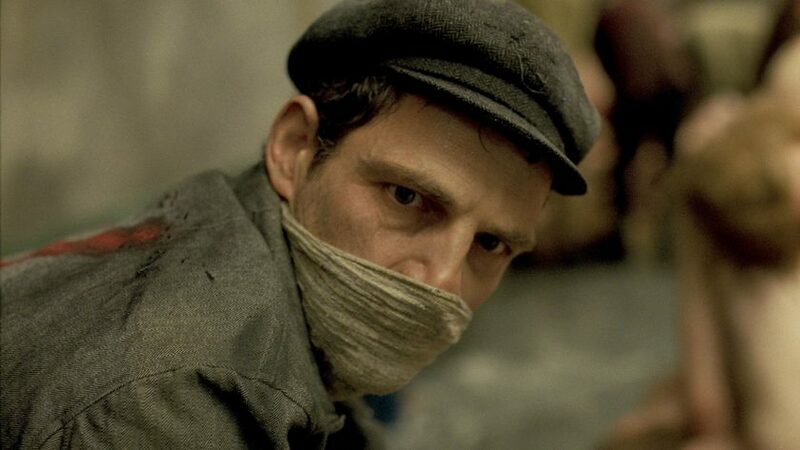 Son of Saul won the Oscar for Best Foreign Language Film. It also won the Grand Jury Prize at Cannes and the Golden Globe for Best Foreign Language Film. Within the first minute of the film it is easy to see why it has been so lauded. My plot outline might suggest the film has a sentimental tone, but nothing could be further from the truth. In fact, I can’t think of a less sentimental film, about the Holocaust or anything else for that matter. The film is a fevered, fatal rush around the camp. The camera stays tightly focused on Saul and the people he engages with, with atrocities relegated to blurry backgrounds. The frenzy of the camera is reminiscent of the swooning one-shot approach taken by the recent Victoria. Although there are shots and edits here there are also a lot of jarring, chaotic, hand-held camera visions of hell. Like Victoria, the formal approach makes us really feel like we’re there with the main character. Being next to Saul is obviously not a good place to be and so the formal approach gives rise to strong feelings indeed on the part of the viewer. ‘Being next to’ is relevant here because Saul is so utterly driven, in such an intense and desperate way, that it is not possible to identify with him. We can only witness his frenetic activities as he storms around the camp. The film and Saul are both so fast it leaves you breathless.